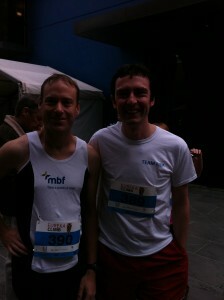 Have had one injury after another since the Melbourne Marathon. Plantar faciitis has been my main concern. So I’ve reduced my running. However, I then at the last minute decided to compete in the Eureka Tower Climb in Melbourne as part of a work team building event. 88 floors, straight up! I’d never done a stair climb before, so I had no idea what to expect. What I was met with was a relaxed, carnival type atmosphere, with lots of show bags and goodies at the race start. The start was staggered which was even better, so it was all about you against the clock and not having to push past people. I hit the stairs running. The stairwell was a lot tighter and more cramped than I had expected. It was also a lot more humid too. I paced myself well, steady jogging step by step (no skipped steps as then the stride would take too much out of my leg muscles early – even though it would have been faster initially). Being in a stairwell, it was hard to figure out how far I had to go, but towards the middle, the running became harder and harder, until I stepped down a gear to a fast lunging walk up every second stair. This worked well, as I was still passing people who had started before me. It was a bit like the walking wounded up near the 80th level. But I knew I didn’t have far to go, so I pushed on. 12mi34sec. Lots of fun. 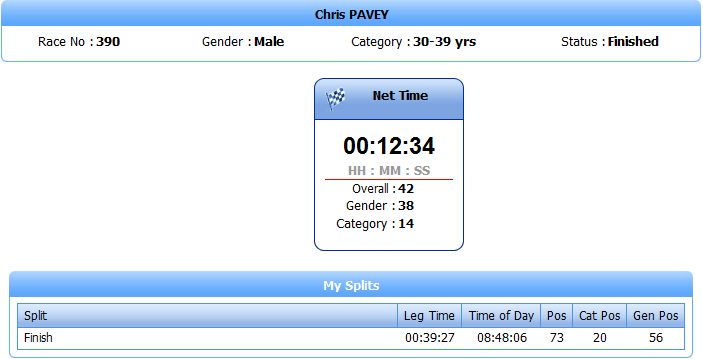 And 42nd which was none to shabby for my first attempt! But somehow I managed to stuff my back in the process. Took me just on 2 weeks to even manage a swim. It all just fell apart, but it was worth it! I had a great experience.